Echo of the Dreamer was started by Margaret Thurman and her daughter, Myoshin, in 1993. Located in the heart of New York City, the Echo team creates a line of beautiful, unique jewelry using natural stones and precious metals. We also carry Echo of the Dreamer's new line headed by Myoshin Thurman, Mars and Valentine, created using vintage pieces in fresh new designs. Our gallery shop carries over 200 of these lovely wearable works of art. Below are some of our currrent pieces. Please call to determine availability. Members receive a 10% discount . Please click on each piece for larger images. check browser tabs to view. A Austrian glass, carved glass, pearls. B Left - Platinum drusy, chalcedony, blue topaz, blue pearl, blue agate. Right - Green kayanite, sugilite, chrysophrase. C Glass intaglio, Austrian glass, white topaz, white and silver pearls. D Left - Blue agate, drusy, kyanite cluster necklace. Right - Kyanite, onyx, drusy. E Left - Blue pearl, blue topaz, blue agate drop necklace. Right - Blue topaz, drusy, blue agate, pearl. F Left - Onyx, coral, tourmalinated quartz. 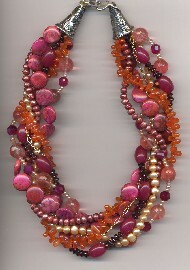 Right - Coral, tourmalinated quartz, onyx, drusy, shell. G Left - Platinum drusy, white and brown topaz, pyrite. Center - Platinum drusy, fossilized shell, pearl, kyanite, mother of pearl. Right - Vintage carved glass, Austrian glass and white topaz. H Vintage glass, Austrian glass, white topaz, pearls, moonstone. I Left - Austrian glass, white topaz - size 8. Right - Vintage glass cabochon, Austrian glass, pearls - size 9. And more of our current Echo pieces . . .
K Antique glass and vintage castings, amethyst. N Tourmalines, smithsonite, aquamarine, opal. P Left - Abalone, turquoise, peridot, blue topaz. 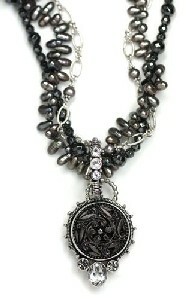 Right - Pietersite, black mother-of-pearl, pearls. Q Vintage faceted Swarovski, white topaz. R Vintage glass reverse carve intaglio, blue topaz, pearls. 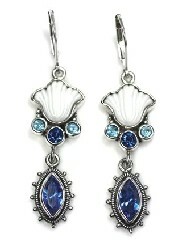 S Carved glass shell, Austrian crystal, blue topaz. V Left - Gold drusy, lemon topaz, pearl, citrine. Right - Vintage intaglio, gold drusy, champagne pearls. 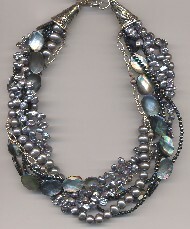 W Platinum tourssade, hematite, pearl, grey mother-of-pearl, sterling strand necklace. Y Hematite, blue & white topaz, glass intaglio. Z Left - Chrysophrase, turquoise. Right - Shells, lemon topaz. AA Dinnerplate Dahlia intaglio, pearls. BB Bracelet of champagne & copper pearls, smoky topaz. CC Green tourmaline, Andean opal, carved phrenite. 22" long. DD Left - Yellow shells, green pearls and lemon topaz. Right - Orange shell, green river rock cluster, pearl. EE Left - Turquoise, onyx, platinum drusy. 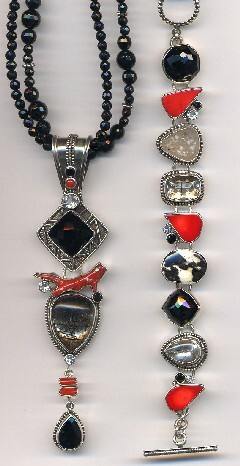 Right - Onyx, mother of pearl, tourmalinated quartz, platinum drusy. 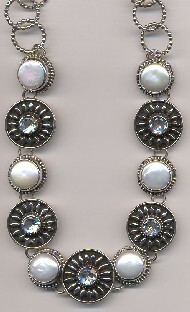 FF Czech glass, white topaz, hematite, pearls. GG Left - White topaz, carved mother-of-pearl, glass intaglio Pegasus. Right - Vintage glass, pink agate, jasper, pink topaz. HH White pearl and white topaz collar. II Left - Pearl, white topaz, onyx, tourmalinated quartz. Center - White topaz, pearl. Right - Vintage glass, carved mother-of-pearl, white topaz. KK Gold drusy, rutilated quartz, mother of pearl, golden pearls. 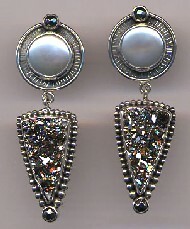 Right - Vintage intaglios, smoky quartz, gold drusy, mother of pearl. LL Turquoise, labradorite, blue topaz, peridot. MM Left - Platinum drusy, vintage intaglios. Right - Vintage intaglio, crystal, gold pearl.